Whatever the end result of the current electoral crisis in Iran, the dramatic rise of national politics has already cast a long and enduring shadow over the geopolitics of the region. No country can go back to business as usual. The climate has changed — for good. (CNN) — Whatever the end result of the current electoral crisis in Iran, the dramatic rise of national politics has already cast a long and enduring shadow over the geopolitics of the region. No country can go back to business as usual. The climate has changed — for good. Before the June 2009 presidential election, the realpolitik of the region had placed Iran, Syria, the Palestinian Hamas, the Lebanese Hezbollah and the Iraqi Mahdi Army on one side of the geopolitical divide, and U.S. and its regional allies on another. With an extended foot in Venezuela, Iran had even a claim on the backyard of the United States. In this precarious condition, the Islamic Republic emerged, not out of its own capacities, but by virtue of serious follies that President George W. Bush had committed in its neighborhood as a regional “superpower.” The presidential election of June 2009 suddenly has made that geopolitics something of an archeological relic. With the commencement of the civil rights movement in Iran in June 2009, the moral map of the Middle East is being changed right in front of our eyes, with the democratic will of one nation having thrown a monkey wrench into the geopolitics of the region. The moving pictures of Iranians flooding colorfully into the streets have forever altered the visual vocabulary of the global perception of “the Middle East.” Tehran, I believe, is ground zero of a civil rights movement that will leave no Muslim or Arab country, or even Israel, untouched. “The unrest in Iran,” the prominent Israeli columnist Gideon Levy of Haaretz said recently, “makes me green with envy.” However things may turn out, Mahmoud Ahmadinejad comes back to the global scene with a lame-duck presidency that may last anywhere from few months if the mounting opposition succeeds in demanding a new election, or else go to a full term if it fails. In either case, there is a domino effect of Ahmadinejad’s weakened second-term presidency in the region. Syria’s position in its immediate regional context is seriously compromised. The rushed and injudicious siding of Hezbollah’s Hassan Nasrallah with Ahmadinejad has wedded the fate of the Lebanese group with that of the discredited Iranian president. Hamas would now be more inclined to strike a deal with Fatah and join President Obama’s renewed peace process. And the Mahdi Army now has to fend for itself in more pronouncedly Iraqi (even nationalist) terms, making easier for the U.S. military to leave. The domino effect, however, is not limited to the allies of the Islamic Republic and extends well into the domains of its nemesis, for now the options available to the United States and its regional allies regarding Iran’s nuclear ambitions have also become categorically compromised. The feasibility of an economic blockade or a military strike has become increasingly difficult to sell to the international community. The heroic fate of young Iranian men and women has become a global concern. How can you starve Neda Agha-Soltan’s soul-mates, or even worse, bomb them We have to start thinking of a new term for “the Middle East.” It is central, but to no one’s East or West. The Green Movement has re-centered the world. As Obama wisely keeps Ahmadinejad at an arm’s length and as his task in securing a just and lasting peace between Palestinians and Israelis has just been made much easier, let it be known that this is the gift that thousands of young and old Iranian men and women have just handed him. A severe crackdown has dampened the spirit of the civil rights movement in Iran. Scores of peaceful demonstrators have been killed or injured, and hundreds of civic leaders and public intellectuals have been arrested. The leaders of the Green Movement are being accused of treason and threatened with execution. Human rights organizations are deeply troubled, and even worse news might still be in the offing. But the morning has broken, and there is much that a simple march of the youth in the United States and around the globe, particularly across the Arab and the Muslim world, all brandishing a green bandana, can do for their momentarily silenced brothers and sisters in Iran. They have sung their native song. They are awaiting the global chorus. 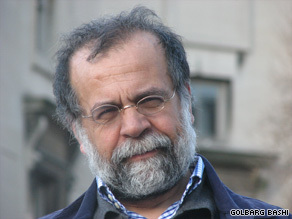 The opinions expressed in this commentary are solely those of Hamid Dabashi.